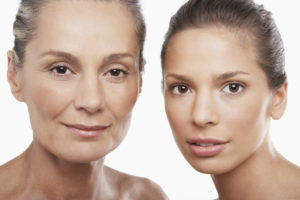 One of the best ways to ensure good skin care is to gain an understanding of how your skin ages in the first place. Once you have identified your aging concerns, it becomes much easier to select the most effective solution. In this blog post, Dr. Jonathan Grant, M.D., F.A.C.S., a dual board certified facial plastic surgeon in Mt. Vernon, Washington, discusses common aging concerns by decade and the surgical and non-surgical treatments that can address them. Upon entering adulthood, you may begin to notice that your face is more defined and mature than previous years thanks to the loss of “baby fat.” In addition, your skin’s collagen supply is high, contributing to a supple, firm and healthy skin appearance. Still, small lines and wrinkles may begin to form on the forehead and around the eyes. If you are in your 20s, the best thing you can do is follow a good skin care regimen and practice healthy lifestyle habits, including not smoking and using proper sun protection (i.e., sunscreen, sunglasses and a sun hat). Both smoking and sun damage can speed up the aging process, and the majority of damage done will not become apparent until later on in life. Non-surgical cosmetic options such as laser skin resurfacing and Botox® or Xeomin® have become increasingly popular among individuals in their 20s as these procedures can minimize signs of aging before they become prominent on your skin. As you age, your skin’s collagen gradually loses tone. This, paired with stress from parenthood and work as well as other factors, can affect the appearance of your skin. Fine lines and crow’s feet in particular may become more visible. If you were lax on skin care during your 20s, your 30s is the perfect time to become more serious about the health and beauty of your skin. Using skin care products that have medical grade ingredients like retinol and hyaluronic acid can nourish your skin so it retains its youthful glow from your 20s. Treatments like microdermabrasion and skin resurfacing can be very effective at stripping the skin of impurities that age you to restore or maintain healthy skin. By the time you reach your 40s, the lines and wrinkles around your eyes and mouth have likely become more evident while creases on your forehead have likely deepened. Loss of volume in the face also becomes more apparent in your 40s and 50s, which can cause the eyes to look sunken or hollowed out. Cosmetic procedures that focus on rejuvenating the eye area are popular among middle-aged individuals. Surgical options include eyelid surgery (blepharoplasty and skin pinch) and brow lift, which can restore a youthful and more energetic eye appearance. Non-surgical options include Botox® or Xeomin® and dermal fillers, which can be used to soften laugh lines and restore lost facial volume. Skin resurfacing can be used to address age spots, uneven skin tone and hyperpigmentation stemming from the natural aging process and years of sun damage. Typically the 40s and 50s are when patients also start to consider “mini-lift” procedures for loose skin in the neck and heaviness in the jowls that can start in this age group and cannot be fully corrected with injectable products or skin care alone. Individuals in their 60s often have the same concerns as patients in their 40s and 50s, the only difference being that the aging is more pronounced. For this reason, more invasive procedures such as facelift and neck lift are often more appropriate choices. The gold standard especially in lower face and neck rejuvenation, the facelift addresses various aging signs on the middle and lower areas of the face. Facelift can be paired with eyelid surgery, Botox® and dermal fillers to produce more comprehensive results. Dr. Grant has experience treating patients of all ages in Mt. Vernon and the surrounding area. To discuss your skin aging concerns with the facial plastic surgeon, please contact our office today.